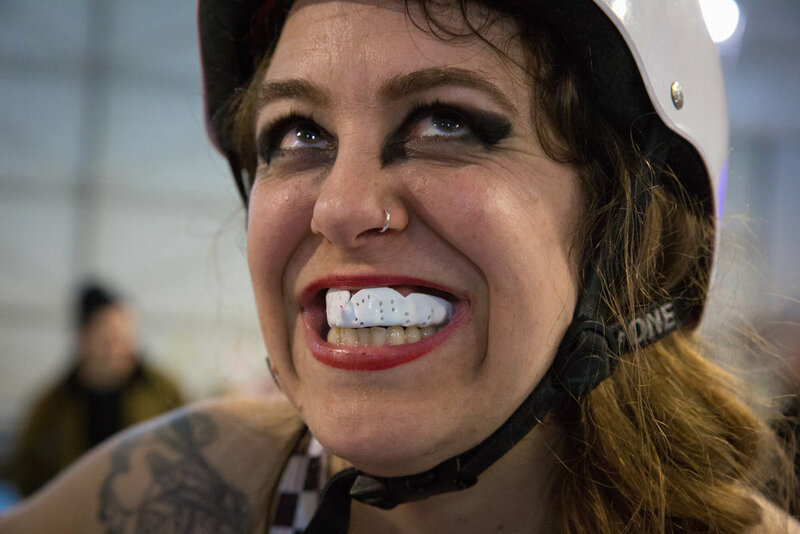 The Rose City Rollers (RCR) derby league in Portland, Ore., has competitive and recreational teams with over 400 female skaters ranging from age 7 to 60. The Break Neck Betties, one of the RCR competitive women’s teams, take advantage of a mild evening and do some pre-game exercises outside the Oaks Park Hangar in Portland, Ore. on April 4, 2018. Break Neck Betties jammer ThunderDame tries to push past blockers during a practice drill on Feb. 21, 2017. Portland's Fire Marshal has declared the Oaks Park Hangar where 17 RCR teams practice and compete, unsafe. The league needs to install a costly sprinkler system, limit attendance at games, or find new venue by July 2018. The Break Neck Betties, one of the RCR competitive teams, gather for a pre-game meeting and meditation led by Coach Ripley on April 8, 2017. Fleur de Lethal waves to the crowd as she's introduced by the emcee on March 24, 2018. Lethal is one of two new players drafted by the Betties at the start of the 2018 season. Between playing and coaching, she has derby commitments six days a week. Franz bakery of Portland, established in 1906, is a "Hip Check" level sponsor of the Rose City Rollers. During halftime at every game staff and emcees toss loaves of fresh Franz bread into the audience. Several days a week, Smelter Skelter commutes 3-4 hours to and from her home on the Oregon coast for roller derby. She is the only skater to have served a penalty for facial insubordination. Smelter Skelter (center) and Betties teammates block Guns N Rollers skater during a game on May 13, 2017. Guns N Rollers defeated the Break Neck Betties 226-222. Sproutta Control, Chevy ShoveHell, and Gingeraffe form a defense line against their opponents, the High Rollers. The Betties defeated the High Rollers 363-323. A fierce competitor, Ripley challenges a referee's call during a game against Guns N Rollers on May 13, 2017. Five months pregnant, she's unable to play this season and opted to coach the team instead. Roller derby is a brutal contact sport. Players wear helmets, mouth guards, wrist guards, and kneepads to protect themselves against injury. Break Neck Betties huddle at halftime during a game against the High Rollers on April 8, 2017. When not competing, practicing, or cross-training together, the Betties are a close-knit crew. They choose to spend much of their free time together socializing and supporting each other in non-derby activities. IV CardiAttack (center) skates through a pack of High Rollers on April 4, 2018. As the jammer, she wears a star helmet cover and scores points for each opposing team player she skates past. Susan B. Animosity (front) and the Betties shake hands with opponents Guns N Roses. Though they are intense rivals on the track, many have close friendships with players from teams across the league. Break Neck Betties hold the league record for the most championship wins in Rose City Rollers history. Ovarian Barbarian signs autographs for young fans on April 8, 2017. Many girls look up to the Betties as role models. Break Neck Betties team mascots Leet Seeking Missile and Dee Dee Monic! leave the Oaks Park Hangar following a Betties win over the High Rollers.